The Virtual Boy hardware includes the console as well as a variety of accessories. The Virtual Boy is Nintendo's first 32-bit system. The PPU is 16-bit, and the hardware control unit is 8-bit. The Virtual Boy system uses a pair of 1×224 linear arrays (one per eye) and rapidly scans the array across the eye's field of view using flat oscillating mirrors. These mirrors vibrate back and forth at a very high speed, thus the mechanical humming noise from inside the unit. Each Virtual Boy game cartridge has a yes/no option to automatically pause every 15–30 minutes so that the player may take a break. One speaker per ear provides the player with audio. The Virtual Boy Console was the first video game console that was supposed to be capable of displaying "true 3D graphics" out of the box, in a form of virtual reality. Whereas most video games use monocular cues to achieve the illusion of three dimensions on a two-dimensional screen, the Virtual Boy creates an illusion of depth through the effect known as parallax. In a manner similar to using a head-mounted display, the user looks into an eyepiece made of neoprene on the front of the machine, and then an eyeglass-style projector allows viewing of the monochromatic (in this case, red) image. The Virtual Boy uses an oscillating mirror to transform a single line of LED-based pixels into a full field of pixels. Nintendo claimed that a color display would have made the system too expensive and resulted in "jumpy" images, so the company opted for a monochrome display. To achieve a color display, Nintendo would have used a combination of red, green, and blue LEDs. At the time, blue LEDs were still considerably expensive and would in turn raise the price of the final product. This in combination with the other drawbacks helped influence Nintendo's decision to release the Virtual Boy as a monochrome device. The Virtual Boy was meant to be used sitting down at a table, although Nintendo said it would release a harness for players to use while standing. The Virtual Boy, being a system with heavy emphasis on three-dimensional movement, needed a controller that could operate along a Z axis. 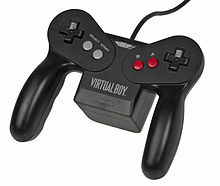 The Virtual Boy's controller was an attempt to implement dual digital "D-pads" to control elements in the aforementioned 3D environment. And, until the Nintendo 3DS's Circle Pad Pro accessory was released, the Virtual Boy was Nintendo's only handheld that had a second directional input. The controller itself is shaped like an "M" (similar to a Gamecube controller). One holds onto either side of the controller and the part that dips down in the middle contains the battery pack. There are six buttons on the controller (A, B, Start, Select, L and R), the two D-pads, and the system's "on/off" switch. The two directional pads are located on either side of the controller at the top. The "A" and "B" buttons are located below the pad on the right side and the "Start" and "Select" buttons are located in the same spot on the left side. What would normally be called "shoulder buttons" ("L" and "R") are located behind the area where the pads are, on the back of the controller, functioning more as triggers. ^ a b c Kevin Rafferty. "Super Mario Takes Leap into Three Dimensional Space." The Guardian (pre-1997 Fulltext): 0. Nov 16 1994. ProQuest. Web. 8 July 2013. ^ Powell, Doug. "A Virtual Backlash." Computing Canada Dec 21 1994: 1,1,4. ABI/INFORM Global. Web. 24 May 2012. ^ John Markoff. "Nintendo Counts on a New 'Virtual' Game." New York Times (1923-Current file): 2. Nov 14 1994. ProQuest. Web. 8 July 2013. ^ Rafferty, Kevin. "Super Mario Takes Leap into Three Dimensional Space." The Guardian (1959-2003): 2. ProQuest Historical Newspapers: The Guardian (1821-2003) and The Observer (1791-2003). Nov 16 1994. Web. 24 May 2012. ^ Guy Perfect (2013-01-04). "Virtual Boy Sacred Tech Scroll - Virtual Boy Specifications". Retrieved 2013-01-21. ^ Guy Perfect (2017-03-14). "Virtual Boy Sacred Tech Scroll - Virtual Boy Specifications". Retrieved 2017-03-14. This page was last edited on 9 June 2018, at 08:42 (UTC).